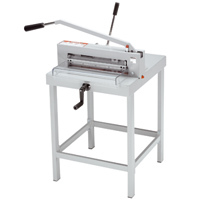 Manual guillotine with 430 mm cutting length (for formats up to A3). Cuts up to 500 sheets of paper (70 gsm) or bound brochures up to 40 mm. High-quality blade made from Solingen steel. Solid steel blade carrier. Adjustable blade guides made of hardened steel. Patented fast flick action clamp. Side lay with measuring scale. Spindle guided backgauge. Fine adjustment of measurement with calibrated scale on the backgauge handle. Solid all-metal construction. Designed as table top machine, a stand is available as an optional extra. cutting stick can be turned or replaced easily from the outside of the machine. Please note: Stand is sold separately.